Adventures of Sound Tech Guy: My New Guitar Amplifer - Found! My New Guitar Amplifer - Found! A new guitar amplifier has been on my wish list of items for a very long time and I have found the one I would like to buy. Marshall Amps came out with the Class 5 combo, tube, guitar amp which is the perfect fit for my guitar setup. I am looking for an amp that I can use to practice with in the basement and also use in a jam setup with my other musician friends. 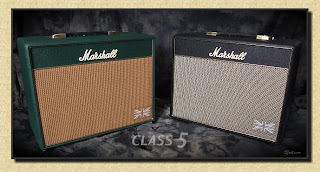 The Marshall Class 5 will work for me with it's small size, low wattage power, and reasonable price point. I just found out that it is now available in two colour finishes: standard black, and green. See attached picture below. Also on the Marshall website is an archived product review taken from "Guitarist" magazine from the UK, written by Mick Taylor for the Marshall Class 5 amp. Check out the review by clicking the link below. It is a PDF file so be patient while it loads up. Enjoy!